He may look like the bass player from a Bauhaus cover band, but Eidos says it's actually toned down the "goth" look of the redesigned Garrett. 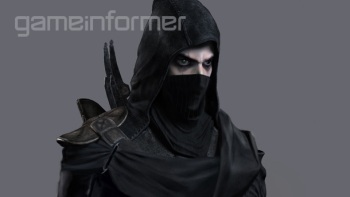 Like it or not, a new Thief means a new Garrett, although game director Nicolas Cantin said that while Eidos had "carte blanche" on the design, the team wanted to keep Garrett's "main DNA" because it works pretty well as-is. But change is inevitable, and the anti-hero of the upcoming series reboot will not be quite as we remember him. "We wanted to bring him more for the modern audience of today's console market," Cantin said. "He's now in the game doing more action moves and that's how we wanted the costume and the suit to reflect that." "Time has moved on," Narrative Director Steve Gallagher added. "We're not still in 1998." Perhaps even more interesting, and certainly more confusing, is Cantin's statement that Eidos has toned down Garrett's "gothic" look to make him more mainstream. "For example, black nails and things like that - we don't have that any more. We want to make him a little bit more mainstream on that," he explained. "Yes, he's a dark character, but we don't want really to say he's a gothic one, even though the Victorian period feels really gothic." Yet while the original Garrett wasn't what I'd call particularly goth, the new guy comes to the party with a pasty, pale complexion, skin-tight leather and more eyeshadow than Siouxsie Sioux. That's not necessarily a bad thing (or so I keep telling myself, as I struggle to keep a lid on the inches-from-freaking-out long-time Thief fan inside me) but if this is the "less goth" Garrett, I can't even begin to imagine what he looked like originally. Bereft in deathly bloom, perhaps - alone in a darkened room. Or am I just missing something here? UPDATE: In response to concerns about all this "less goth" business, Cantin clarified his words on the Eidos Montreal blog. "Hey guys, I think I might not have illustrated some of my points clearly on the video. It's not correct to say that we're trying to make Thief 'mainstream', or that we're trying to make Garrett 'less gothic'... This isn't the case," he said. "I was referring specifically to a previous Garrett design we tried out internally and not Garrett from the previous games. Our early design went a LOT more gothic - with black nails etc - but we thought that this wasn't true to the legacy of Garrett so we pulled it back a bit. Returning to something more true to the original Garrett is what I meant when I said we made him more 'mainstream', this wasn't a comment about the direction of the game," he continued. "I can assure you we're huge fans of the original games and we've done our homework to create a game that maintains the essence of the original. I can't wait to show you more of the game and Garrett soon!" The blog post stated that Thief will be a "story-driven, first-person adventure as made famous by past games in the franchise" and that it will be possible to get through the entire game without killing anyone, adding, "Garrett is a Master Thief, not a killing machine."